AT METALEX, WE STRIVE TO DELIVER PRODUCTS THAT MEET OR EXCEED CUSTOMER EXPECTATIONS AND SATISFACTION. Management demonstrates its commitment to this policy by meeting all requirements of ISO9001:2008 and all applicable statutory and regulatory requirements. 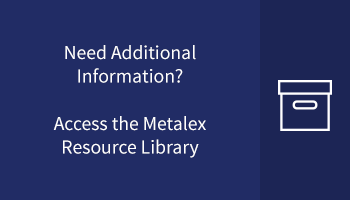 METALEX IS CONTINUALLY IMPROVING QUALITY, SERVICE, AND TECHNOLOGY. We are committed to providing advanced technical solutions with the highest level of quality. All of our materials are guaranteed to conform to the standard specification and tolerances of their producing mills. In addition, all incoming materials are inspected, tested, and recorded by us prior to stocking, again while processing, and a final visual inspection before shipping. Despite all the care taken in our plant during production and in the selection of our sources, it is sometimes impossible to prevent all imperfections or defects. We guarantee, however, to replace with new material any goods that may be proved defective within a reasonable time from date of shipment, and when properly worked or used. But, no charges for any damage, labor or loss, or expense directly or indirectly from use of such material will be allowed. In the event any shipment proves unsuitable, you should immediately discontinue its use and advise Metalex of all the facts concerning the problem. Under the circumstances, we reserve the right to inspect the material in question and to decide whether to rework or replace. Such materials should not be returned without Metalex authorization.